Scott Walker re-election: Can a bold, proud conservative sustain triumph in a swing state? Can a bold, proud conservative sustain his triumph in a swing state? Wisconsin Gov. Scott Walker speaks during the Republican National Convention on Aug. 28, 2012, in Tampa, Florida. Has he delivered, and will voters stick with him? WEST ALLIS, Wisconsin—One of Scott Walker’s duties as governor of Wisconsin is to open the state fair by going on thrill rides with the young woman anointed Fairest of the Fairs. “We went on the Freak Out and she freaked out,” he told a crowd several nights later at the 23rd annual Governor’s Blue Ribbon Meat Products Auction, where Walker helped sell choice cuts to raise money for the 4-H club. “And then the ride started to get slow,” Walker continued, “and she got the look on her face—‘thank God it’s over’—and I looked over at the operator who has been doing it the last three years I’ve been governor and I went like this”—the governor flashed a thumbs-up and a smile—“and he did it all over again!” The governor had launched another round of spinning, dipping, and rolling (and the Fairest of the Fairs nearly freaked out of her sash). This is what Wisconsin elections are like in the Walker era. Just when one intense ride is over, another one starts right up again. Walker, who was first elected in 2010, is facing his third election in four years and his second re-election. His winning battle with unions over bargaining rights became the center of national political attention in 2011, leading to an effort to recall a group of Republican state senators. The next year, Democrats tried to eject Walker, who became the first governor ever to survive a recall. 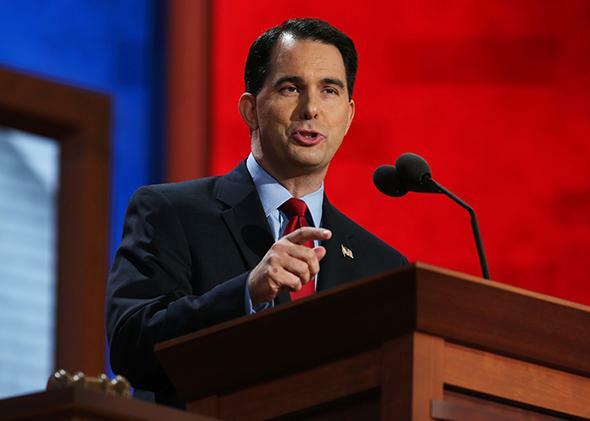 Walker asserted that his 7-point recall victory had proved a simple formula. “Results trump everything else,” he told National Review last November. “If you deliver, voters will stick with you,” he said during the book tour for Unintimidated: A Governor’s Story and a Nation’s Challenge, which hinted at his larger ambitions. Update, Aug. 10, 2014: Republican National Committee chairman Reince Priebus held up Walker as a model Republicans should follow to win back the White House in a speech to conservatives. But now, though, voters are not sticking with Walker as much as he predicted. His approval rating is 47 percent today, (48 percent disapprove) even though 54 percent of those polled say they believe the state is moving in the right direction. Walker’s supporters will say his rating still suffers from the knock-on effects of all the attacks during the recall—except that Walker’s approval rating was near 50 percent before the recall. It may be that those who voted for him during the recall were not fans of Walker or his policies but thought the recall was too extreme. (Thirteen percent of self-described liberals voted for him in the recall, according to exit polls.) This election is a truer test of the Walker theory. It would be easier to test Walker’s claim that his conservative policies attracted nonideological swing voters if there were a lot of those voters in the state of Wisconsin. As Craig Gilbert of the Milwaukee Journal Sentinel laid out in his wonderful series on polarization in the state, Wisconsin is purple not because it has a vast population of intermingled viewpoints; it is instead a state where deep red lives next to deep blue. In this election, the number of voters who are up for grabs—who haven’t come to a settled view about Walker, and who are likely to turn out in a nonpresidential year—is likely to be low. The Walker team’s strategy is to rely on his rock-solid support among likely Republican voters and to pick up a small number of independents who will give him the benefit of the doubt. Incumbent governors don’t usually lose, and at least some swing voters have now voted for Walker in two elections. In the Marquette poll, 7 percent of the respondents approved of the job Obama was doing and the job Walker was doing. “An incumbent governor running for what is essentially a second re-election, with more money than God, has to be the odds-on favorite,” Franklin says. Walker has $7.1 million in his campaign bank account and a considerable national network of donors. He built a list of donors from all over the nation defending against the recall, which became a pitched ideological battle. A recent report shows that he has received more out-of-state money than Burke, who has $1.7 million in her campaign chest plus plenty in her personal bank account—one of the key attractions of her candidacy for party officials. Burke put in $430,000 when she got into the race and has promised to spend more. Burke’s strategy, with its emphasis on tempering partisanship, assumes there are a lot of swing voters who have been turned off by Walker’s brand of politics. Burke’s forces were heartened to see that in the Marquette poll, she and Walker were even with self-described independents, after she had trailed him by 9 in May—possible proof of concept. Burke will need those swing voters, because Democrats don’t traditionally turn out the way Republicans do in nonpresidential election years. The goal for Democrats is to turn out some of the million or so “drop-off voters,” who participate in presidential elections but sit out the other ones. Hatred of Walker among liberals was not enough to help his Democratic opponent in the recall, and it might not be enough now. Burke says that Walker is the reason for the polarization in Wisconsin; Walker’s camp says the polarization existed before he got there. (Gore and Kerry barely won the state in 2000 and 2004.) The two strategies in Wisconsin echo a familiar discussion about the national political picture. If polarization is the new permanent condition of politics, that requires tougher partisan politicians who stake bold ideological claims, cementing their base and pulling just enough from the middle to win. The alternative view is that there is still a group of voters in the middle, and you can aim for them without losing your base. In the Republican Party, Chris Christie represents something closer to the latter view. Christie stresses his ability to work with Democrats. Walker doesn’t do that so much. When Walker talks about solving problems in Washington, his prescription is single-party control, with Republicans occupying the White House and holding strong majorities in the House and Senate. Republicans see an opening in Burke’s base. She is still undefined with voters. Forty-nine percent said they either haven’t heard enough about her or don’t know if they have a favorable or unfavorable opinion of her in the most recent Marquette poll. Republicans believe that if they can upset the image she is trying to sell to Democrats, they will weaken her turnout. “She is a great candidate in the laboratory,” Schimming says. “But is she who she says she is?” Fliers dropped at union households introduce the Harvard-educated Burke as “A Middle-Class Success Story” and the great-granddaughter of farmers. The Walker forces want to portray her as a wealthy hypocrite, which is why Walker ran ads tying Burke to outsourcing practices at Trek. “I believe the Democratic Party platform is not in favor of outsourcing,” says a strategist working on the race. Republicans have been making an issue of Burke’s wealth, talking up her expensive vacations and second home. Some Republicans, such as Sen. Ron Johnson, are nervous that such attacks seek to demonize wealth, but the Walker campaign is willing to take that risk. With such a close electorate, Republicans believe they need to open only a small crack in Burke’s base. “All we need is a few points,” Schimming says. The singing is a testament to vigilance and faith-keeping, but it’s also a symbol of the challenge facing Wisconsin’s unions: There is a faithful, vocal opposition to Walker among their ranks, but will it be enough to mobilize on Election Day? “No one in the union movement will forget what Scott Walker did to us,” says Stephanie Bloomingdale, the secretary-treasurer of the Wisconsin AFL-CIO. If that’s so, then Burke should have lots of help mobilizing her base with the strength of the union behind her. If not, it will be yet another blow for the movement that also sees Walker as a national symbol: as an inspiration for governors across the country to seek limits on union rights. The race is a test for the unions as much as it is a test for Walker’s theory of political leadership. The test is not just about raw power in a state where both sides have solid turn-out-the-vote operations, honed after so many battles. It’s about what messages might move voters in any state. Can a Republican be brought down by close association with the Koch brothers? Can opposition to the union be turned into a greater argument about a lawmaker’s empathy? “You’re beginning to see a shift when voters are asked ‘Who cares about you?’ ” says Bloomingdale, “and that’s starting here in Wisconsin.” In the Marquette poll, 45 percent say that “cares about people like you” describes Walker. Forty-nine says it does not. Burke does better with the voters who know her—with 7 percent more thinking she cares about them—but 30 percent don’t know her well enough to form an opinion. The campaign debate has now focused around jobs. The Burke campaign is running an ad showing Walker during his first race promising he will create 250,000 jobs. He hasn’t: Wisconsin lost 1,700 jobs in May and June of this year. “We’re dead last in job creation in the Midwest,” says Burke, who is making her 70-page jobs plan and pledges of fiscal conservatism the centerpiece of her campaign. Walker says he was just pushing the state to achieve high goals when he made that campaign promise. Wisconsin has created 100,000 jobs on his watch, he says, and the unemployment rate has dropped from 7.7 percent to 5.7 percent. Neither candidate has a clean shot. Burke has had to use fake math to attack Walker, and the governor defends himself with a little sleight of hand too. Burke, he says, will take the state back to the days of job losses under Walker’s predecessor, Jim Doyle, whom Burke served as commerce secretary. “We see a shift of losing 130,000 jobs to gaining more than 100,000 jobs,” Walker says. “We see a shift of 230-some-thousand jobs.” The creative math makes Walker and his team often sound like Barack Obama did in 2012, pointing out modest improvements and offering caveats. Meanwhile, the Burke team sounds like the Republicans who regularly pointed out that the unemployment rate was not as low as Obama’s economist Christina Romer had promised in a document. There are many styles of leadership in the Republican Party. Ted Cruz gives speeches and takes firm stands but doesn’t accomplish much of weight; he’s toxic in swing states. Chris Christie has accomplishments he can point to in the blue state of New Jersey, but conservatives don’t trust him. Walker talks like a conservative and has accomplishments to show for it. In the most recent Marquette poll, 66 percent said he was a governor who gets things done.